No matter your credit situation, our financial specialists will help you find your ideal financing plan. Financing at Coupal & Brassard is easy and efficient. We always strive to make your experience with our financial advisors as enjoyable as it can be, and that is why we do everything we can to ensure your complete satisfaction. Once you have found the new Nissan vehicle that best suits your needs, our financial services representatives will be sure to find the financing or leasing solution that meets your budget. At Coupal & Brassard, we can help you find the financing or leasing solution that suits you best. We will take the time to fully understand your situation and budget, and how you plan to use your vehicle so that we can customize your financing or lease according to your needs. If you're buying a used vehicle, Coupal & Brassard offers you a host of affordable financial services, including second chance credit financing solutions. At Coupal & Brassard in Chambly and Saint-Jean-sur-Richelieu, we know that you cannot always control your credit and that misfortunes can occur. That's why we'll work with you to not only find you an appropriate financing solution but also to help you rebuild your credit. At Coupal & Brassard, we will be able to help you find the financing solution that suits you best. No matter what your Nissan financing or leasing needs, we are here for you! 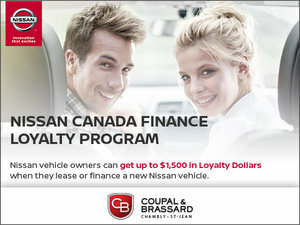 Come in today to Coupal & Brassard Nissan in Chambly and Saint-Jean-sur-Richelieu to find the financing or leasing solution suited to you. Do you have credit problems that stop you from buying the vehicle you want? At Coupal & Brassard Nissan, we’re here to help. Our two Nissan dealers in Chambly and Saint-Jean-sur-Richelieu have helped thousands of customers find the perfect Nissan vehicle for them despite their imperfect credit, and we can help you too! Our 2nd and 3rd chance credit experts will be able to help you find the financing solution that best suits your needs. At Coupal & Brassard, car credit is our specialty, and we can help you buy the used vehicle you want with a personalized financing solution. Learn more about our 2nd and 3rd chance credit solutions today. We will take the time to advise you so that you can make an informed decision. 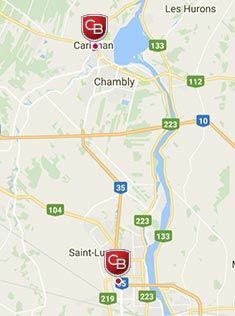 Come in today to Coupal & Brassard in Chambly and Saint-Jean-sur-Richelieu and we can help you find the auto financing you need!